Short-cut to finding a good bodyshop. Since the introduction of our new MMS system we get lots of people sending us photos of damage to their car and unfortunately we can't handle all of it. A picture sent to us of a car that needs attention from a panel beater. At least 3 times a day we are referring people to body shops in our area because we know all the good ones. And for people not in our area we offer advice on how to find a good body shop near them... you see, not all body shops are the same, mainly because different businesses aim at different markets - they will vary greatly in quality and in price. Some companies work mainly for insurance companies and while they produce very good work they tend to be expensive. At the other end of the scale you will find the 'bloke up a bumpy road' who may be cheap but the quality might not be so great - having said that, he might not be all that cheap, and in any kind of business there are cowboys who will charge a small fortune for a very poor quality job. So while it is possible to phone around for quotes, finding a reasonable price is not an indicator of quality - and believe me, if you need a repair it is worth doing properly because it will effect the resale value of your car. Always get a recommendation from somebody before going to a body shop. The simple answer to finding a good quality car body repair centre is to ask the expert consumers in this field - Car Dealers! When a car dealer gets a panel repaired, they do so for profit. They know that they they can buy a car cheap because it has some minor damage, and by having a repair done they increase the value of the car - of course, they want a quality job otherwise it won't do much to increase the value and it means they will have a harder time selling the car. But while they are looking for a quality job, they don't want pay over the odds either! The cheaper they get the job done, the more profit for them (Or should I say, the more profit they get to keep, as Gordon Brown taxes them on the difference between what they bought the car for and what they sold if for, regardless of how much they spend in between). Believe me, car dealers never pay more for anything than they need to, so you can guarantee that a car dealer will have already done the shopping around for you, and will have tried all the body shops in your area and will be able to comment on quality. In fact, you might even find that one dealer may use 2-3 different body shops for different kinds of work. "Can You use a spray gun Terrence? I have a nice little earner for you!" So instead of opening up the yellow pages and phoning around the panel beaters for a quote, instead have a think about car dealers and dealerships in your area. Try and think the ones that look fairly smart and have nice looking cars in the showroom. 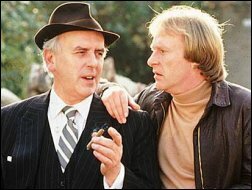 Obviously you don't want an Arthur Daily or a Swiss Tony - so avoid camel hair coats and bunting at all cost. Nor should you go to the big main dealers with their own paintshops - they tend to be more expensive to their retail customers and the quality could still vary. Look for dealers that have cars that are mostly 3-5 years old and ask them, "which paint shop do you use?" Try and phone 2-3 dealers, better still, pop in and see them if you have the car, and with any luck, they may all recommend the same few body shops. Once you have the names of a couple of body shops, go and see them for quotes... now, the next thing we recommend you do is ask them if they have a booth/oven. In order to get a proper job, you have to have a proper spray booth and all the other specialist equipment for drying the paint. This is especially important from now on because as of 1st January 2007, all paint shops are switching over to a new water-based environmentally friendly paint which takes longer to dry. While on this subject I must mention that this new paint is harder to work with, as many spray shops have already made the switch, standards have fallen slightly. This is only to be expected because it is a massive change within the industry and the poor painters have a lot to get used to. This means that you should perhaps be a little more forgiving than you would have been a couple of years ago - however you should not allow a painter to use this as an excuse for palming you off with a really low quality job. The paintwork should be close enough that the difference doesn't leap out at you regardless of which light, or which angle you see it in. Even with a colour that you might think simple to match, like black or white, it is impossible to exactly match the original - this is especially true with metallic colours. Even in the factory, colours can vary, and you can often see that certain panels are a different colour from others. All sorts of things from humidity to temperature, and even static electricity can effect the way paint falls and dries on a panel, so even if you have paint from the exact same batch as that used on the production line, the colour will not be exactly the same... but with any luck it will be so close that you will never notice. Sometimes it is the case that the colour looks exactly the same, but in certain lights it looks different. This is acceptable. This colour difference is why good painters will usually blend the paint in. This means that if you have to have a door painted, they may blend it out on the panels either side meaning that you need to have 3 panels painted. If you have had an area of your car painted, then somebody with a trained eye will be able to tell, as can most people if they look close enough so don't expect perfection. But if the painted area jumps out at you from ten feet away, then it's not an acceptable job. The texture of the paint should be even and not too far different to an area of original paintwork. Sometimes, re-painted areas suffer from what is called 'orange peel'. The texture of the paint does resemble the peel of an orange. Paintwork is never completely smooth like glass (if it were it would show up every imperfection) and if you check your original paintwork you will see this. New paintwork should not differ wildly from this. There should be no pimples or bits of dust in the finish. Even good painters occasionally get a bit of dust in the finish, but they will flatten and polish it out. 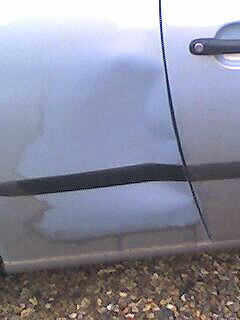 A good painter will also ensure that your car is not returned to covered in over spray. Don't expect to get it back valeted, but if the paintwork and your windows feel rough, then they are probably covered in over spray... at the very least ask the painter to demonstrate that it comes off easily. Turn on your windscreen wipers at the body shop -- if your windscreen is covered in overspray your will *hear it* in the wiper blades. About our valet and smart repair appraisal system. Our win-win policy means you never get sold more than you need. Find out how Clean Image can help you with your leas car over the period of your lease. Leasing a car for the first time? You be aware of your responsibilities.